The trial of Peterborough Labour MP Fiona Onasanya has today (Wednesday) been adjourned after parties brought a matter to the attention of the judge during a court recess. Onasanya is on trial at the Old Bailey accused of perverting the course of justice, and yesterday the court was told by the prosecution that the MP plotted with her brother to evade a speeding prosecution by claiming a Russian man had been behind the wheel. However, resuming proceedings this afternoon Judge Nicholas Hilliard QC explained to jurors that the "parties have drawn to my attention a matter during the break and it just needs checking from everybody's point of view". The case has been adjourned until tomorrow, Thursday, November 15 at 10.15am. The court heard yesterday that at 10.03pm on July 24 last year, Ms Onasanya's Nissan Micra was allegedly caught by a speed camera on The Causeway near the village of Thorney, in Cambridgeshire. 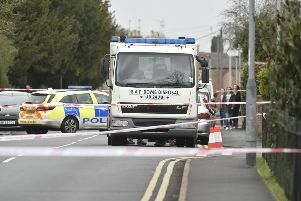 The incident happened the week after the newly-elected MP for Peterborough had broken up for the summer recess last year, jurors were told. A Notice of Intended Prosecution (NIP) was returned, naming the driver of her car as Aleks Antipow. But jurors were told Mr Antipow was at home with his parents in Russia at the time. The Russian had previously lived in Chesterton in Cambridge at a house rented by Onasanya and her brother Festus, the court heard. The contact address and phone number given for him were also linked to Onasanya’s 33-year-old sibling, it was claimed. Festus Onasanya, of Chesterton, Cambridge, had deployed the same tactic when his car was caught by a speed camera on June 17 and August 23 last year, jurors heard. Last Monday, he pleaded guilty to three charges of perverting the course of justice, including one relating to the July 24 incident. Mr Jeremy told jurors that Onasanya was a busy person but had “trapped” herself in lies by adopting her brother’s methods of making a speeding prosecution disappear. He said: “This case may have started as a case about an offence of speeding. “It has become, as a result of the choices made by Miss Onasanya, a case about lying. Lying persistently and deliberately. Lying all the way to this court, maybe about lying in this court. “Lying a way that has had to be co-ordinated with lies told by her brother. Lying to avoid prosecution for a breach of the laws that apply, or should apply, to every single one of us whoever you may be. On February 3 last year, Onasanya, a trained solicitor, had no difficulty correctly filling out an NIP form after triggering another camera the month before, the court heard. That time she had avoided points on her licence by going on a speed awareness course. A police investigation allegedly found her two mobile phones were in the area of the traffic camera around the time it was activated on July 24. And she had not claimed expenses for accommodation in London since the Friday before, the court heard. The Cambridgeshire Police camera unit sent an NIP to Mr Antipow but it was returned to sender. Another NIP letter was sent to Mr Antipow but again received no response. Mark Williams, an investigator from the Cambridgeshire Camera Ticket unit, repeatedly tried to contact Ms Onasanya. On November 2, she allegedly told him that she “stands by her nomination”. When she attended a voluntary interview at Bedford Police headquarters on January 2, she declined to answer questions. Mr Jeremy said: “It must, as some of us may know, be very irritating to receive that bit of paper telling us that we have triggered a speed camera and asking us to name the driver of the car. “But while irritation is understandable, telling lies to frustrate an investigation into an offence is not. “What Miss Onasanya did when her vehicle was trapped on the 24th July 2017, was not just to own up and tell the truth which would have been so much better but to adopt her brother’s method of evading prosecution. Ms Onasanya, from Peterborough, has denied one count of perverting the course of justice. The trial, which is expected to go on for a week, was adjourned until Wednesday.